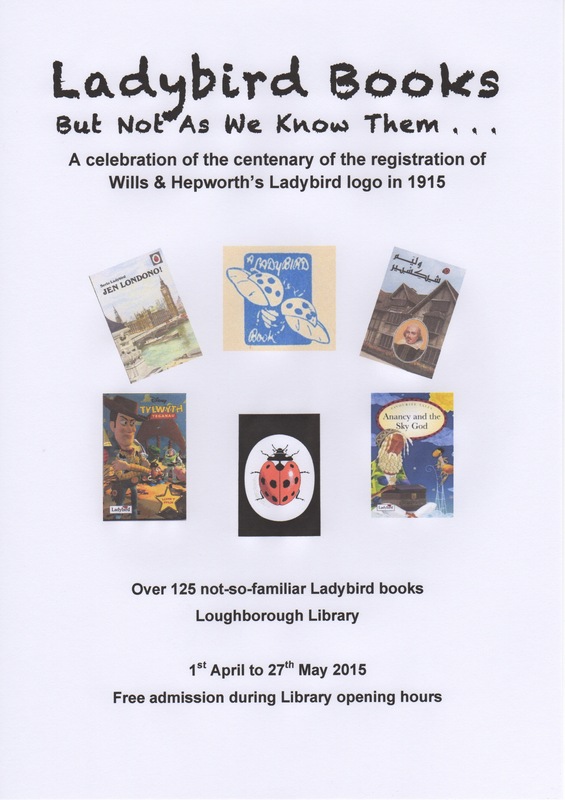 Loughborough History and Heritage Network | Ladybird Books – but not as we know them! Ladybird Books – but not as we know them! Loughborough Local Studies are hosting a display of over 125 not-so-familiar Ladybird books to mark the centenary of the Ladybird logo registered by Loughborough stationers and publishers Wills & Hepworth Ltd. Among the items on show are examples of Ladybird books in several unusual guises, including books translated into well-known and more exotic foreign languages, the Initial Teaching Alphabet reading scheme of the 1960s and English language editions aimed at children learning English as a foreign or a second language. The exhibition was opened at 11.00am on Wednesday 1st April by Mr. Ray Wright, Lithographic Supervisor of Ladybird Books. Mr. Wright’s career as a printer with the company spanned 38 years and he was among those employees who were present at its closure in Loughborough in 1999. The exhibition will run from April to the end of May 2015. Admission is free during Library opening hours.